We are in the bus heading out to the Roman ruins of Volubilis, from our morning spent in Meknes. We woke up a bit early again, but both slept soundly until then. I heard the call to prayer from a nearby muezzin this morning at about 06:00. We dressed and went down to breakfast just after 07:00. This morning there was no buffet, but a waiter brought a continental breakfast of freshly squeezed orange juice, croissants, baguettes, pastries, and yoghurt to our table. Leanne was next down to the breakfast room and sat with us. After eating, we packed our bags and cleaned up before heading out for the morning meeting at 09:00. The first stop was at a lookout on the hillside overlooking a valley which cut through the town. There we met our local guide for the day, a woman named Atimadh. She was very knowledgeable and told us a lot about the history of Meknes and the Berber people who settled in the area, as well as the Moorish and Jewish history of the area. We got underway, stopping in a couple of places outside the old walls of the ancient medina and saw some of the decorated gates, including the Bab Lakhmis Gate. 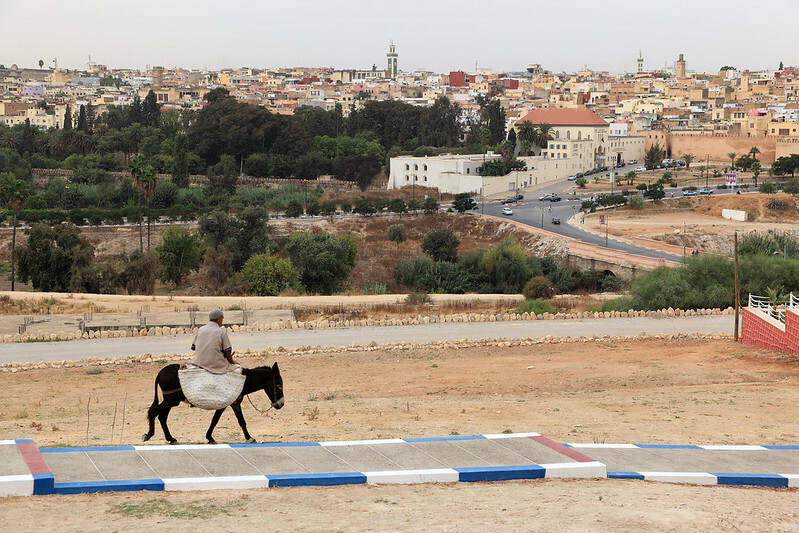 Much of Meknes was built under the rule of Moulay Ismail Ibn Sharif, who made Meknes his capital in the early 18th century. One of the things he had built was the Agdal Reservoir, where we stopped for a while. It is a large rectangular pond which had a nice view of houses on the hillside above, and a view across the valley on the other side to some old ruins, which were topped with hundreds of storks and their nests. Nesting on a little island in the reservoir were herons. 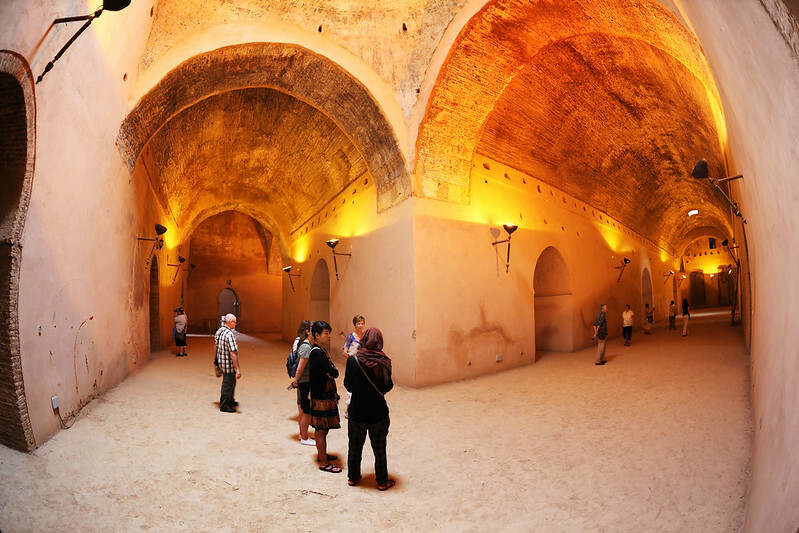 From the reservoir, we walked into the ancient granaries of the city, which were a series of rooms with high stone ceilings, connected with high arched doorways. It was lovely and cool inside and Atimadh spent some time telling us about them and their history, saying it took twenty-five thousand slaves ten years to build the granaries. Moulay Ismail commanded all these slaves and also had twelve thousand horses. The next stop was the adjoining stables, where all those horses were stored. This was an enormous area with thick stone columns supporting four way arches. Originally it had supported a flat cedar roof, but that had collapsed in the Lisbon earthquake in 1755, so it was open to the sky now. The regular grid of columns stretching into the distance made a fantastic landscape of receding arches and we spent several minutes wandering around and taking photos while Atimadh told us more about the history. 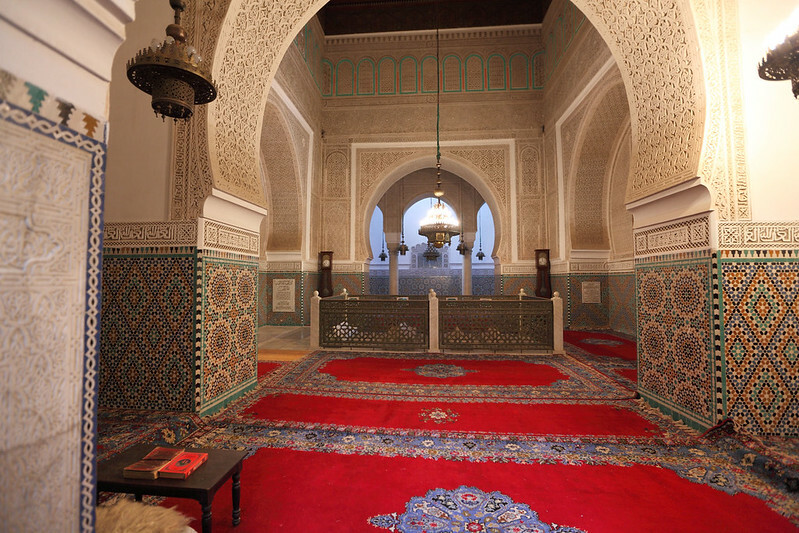 Next we drove to the Mausoleum of Moulay Ismail, which was originally his own private mosque, which we walked inside. It consisted of several linked rooms with marvellous tilework on the floors and walls, in white, green, blue, and a reddish brown. The colours represented the four ancient cities of Morocco, green for Meknes, blue for Fes, red for Marrakesh, and white for Rabat. The rooms were linked with arched doorways, a couple of rooms had fountains, and a couple were open roofed to the sky. The innermost chamber we could go in had a fountain and a restored cedar roof with intricate paintwork. Atimadh pointed out some features of the decorations, including six-pointed stars of David and Byzantine crosses. A further room was Ismail's tomb, but it was roped off and we could only look in at the ornate decorations, which included two wooden grandfather clocks of all things. Ismail had a thousand wives (28 of which were "favourite wives") and 867 children. Atimadh said that Ismail had requested a princess for a wife from Louis XIV of France, but the French king had refused and sent the grandfather clocks instead. Atimadh said that that was actually a better deal because the clocks had lasted longer than the princess! Across the road from the mosque was a shop run by an artisan collective which the tour company supported. 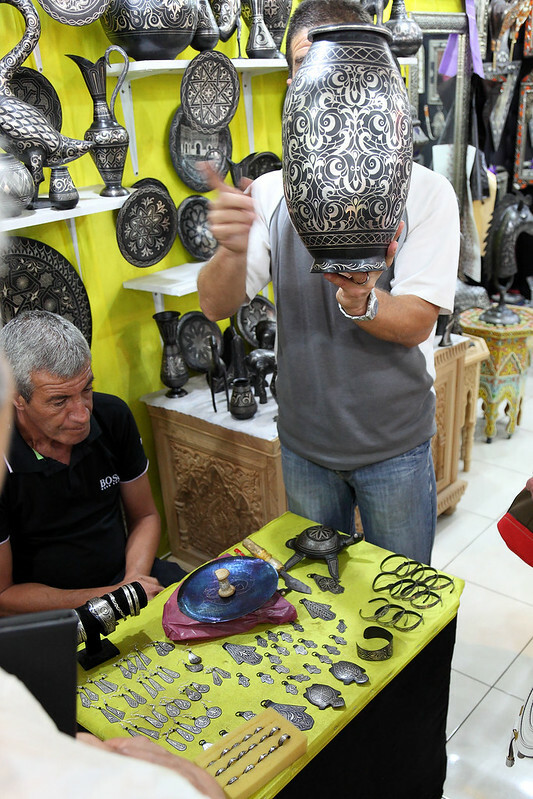 Two men there showed us a demonstration of the Berber artwork of hammering silver wire on to iron pottery and sculpture. First they make the item out of iron, then they scratch the surface to make it very rough, then they take fine silver wire and apply it with a tiny hammer to press the silver into the surface. Then they polish it up until it's smooth, leaving a silver design on the black iron surface. They also showed us traditional Berber embroidery, which was cunningly crafted so that the pattern appeared on both sides of the cloth. They had everything from large tablecloths to napkins, and they were all beautifully coloured and with intricate geometric designs stitched into them. M. found a silver, turquoise, and coral bracelet, which we knew from Atimadh was the traditional colours and materials of her Berber tribe, since she was wearing some similar pieces. Other Berber tribes would have different materials and colours. The price with a tour group discount was 1000 dirhams, and I was amazed that it was solid silver for that price, as it was quite chunky and heavy. We also found a similar design necklace pendant as a gift for my mum, and got a joint purchase discount for that. The shopping took quite a while, and several of us were waiting outside in the breeze for some time. Eventually, when everyone's purchases were completed, we went off in the bus again to the main square of Meknes. This was opposite the famous Bab Mansour Gate. The gate is named after its architect, El-Mansour. 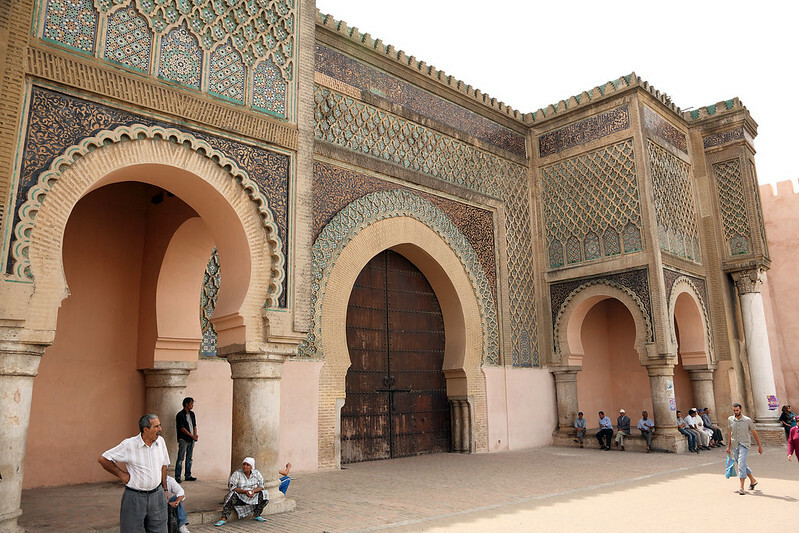 Inspecting the ornately decorated gate, Moulay Ismail is said to have asked the architect if he could do any better. Mansour decided he'd better answer "yes" to please his sultan, but this was the wrong answer - Moulay Ismail was so enraged that Mansour hadn't done his best possible work that he had him killed on the spot. 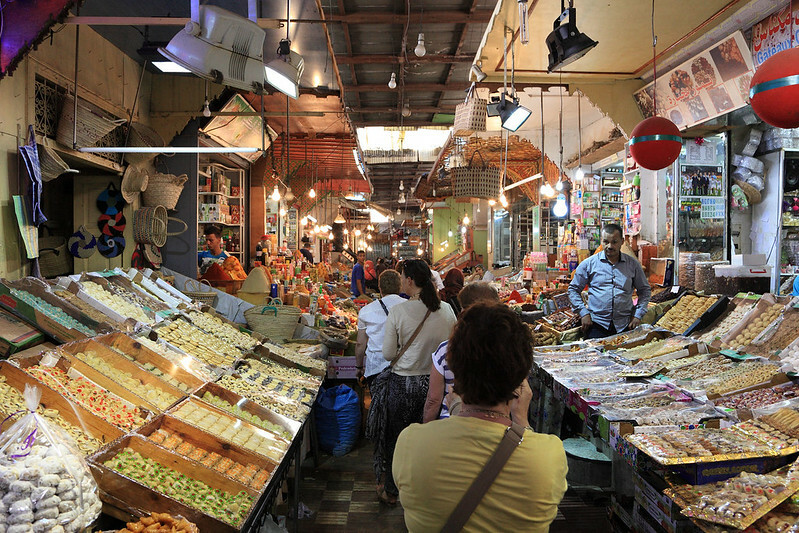 Immediately across the street from the Bab Mansour Gate is a large square, where we visited the market to buy ingredients for a picnic style lunch. 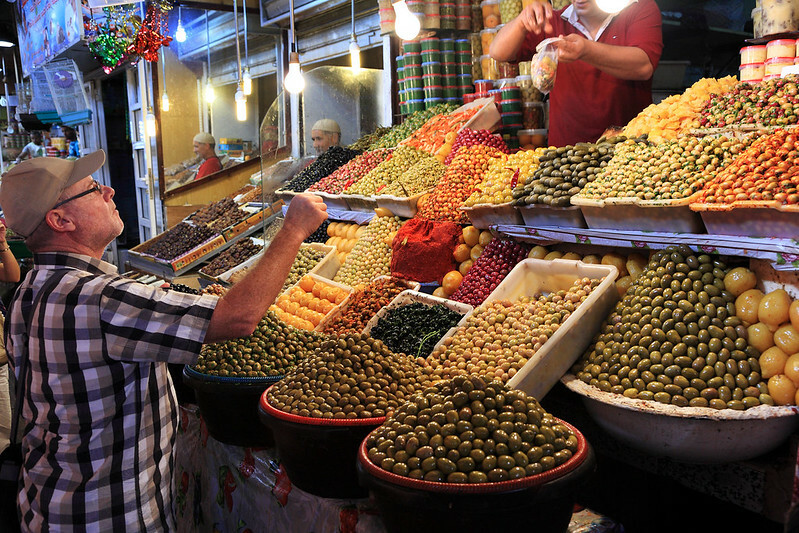 The market was amazing, with hundreds of closely packed stalls selling spices, fresh fruit, dried fruit, olives, nuts, cakes, biscuits, meat, eggs, and even live chickens, rabbits, and pigeons, which were penned right next to the cut meat. One stall had a type of threshing machine, into which a man was feeding a dead chicken to rip the feathers off. Outside there were people with carts of the flattish round bread we have seen everywhere. Atimadh took some of the group, including M., to buy fruit and sweets, while Lahcen took me and some others to get bread and cheese. They took us to sellers who they selected as having safe food to buy and helped us with the prices and our handfuls of coins. We ended up with a loaf of bread, a commercial pack of soft cheese wedges, dates, dried figs, and a pair of fresh oranges. Lahcen led us to a cafe which had a rooftop terrace overlooking the square and an external part of the market, which sold clothes, shoes, and household items. Waiters arranged large umbrellas to shade some tables for us. We spread out and shared our assorted purchases. In particular I grabbed some delicious assorted olives from Zi, and Ben shared a box of biscuits which he'd splurged on, while we shared some of our dates and figs. On the way to the cafe we lost Anna again, and it took us until we were on the roof to inform Lahcen. Then someone spotted her in the square below and we yelled her name and waved until she saw us. When she rejoined us, she was in a bit of a panicked state, as she'd been wandering around trying to find us for some time. She collected herself after a few minutes and was joking about it with everyone. When she went to the toilets I said we'd take a group photo of everyone while she was gone, which got her laughing. 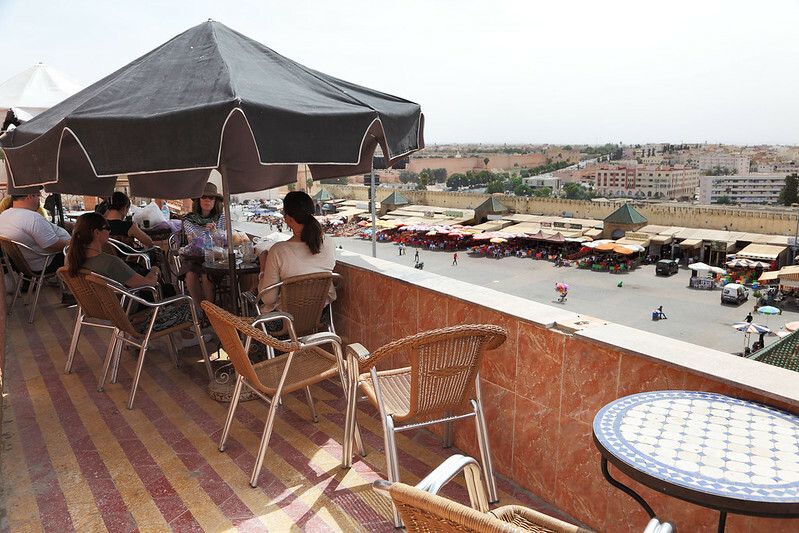 The lunch was excellent, overlooking the square and market of Meknes below. Between all of us we'd bought much more food than we could eat, so Terry collected the leftovers and took it downstairs. He later told us that he'd found a woman sitting on the steps of a mosque, with a young child, obviously begging. He offered her the bag of food, opening it to show her the contents, and she had accepted gratefully and given him kisses on each cheek. Picnic lunch in cafe overlooking the square in Meknes. Done with lunch, we said goodbye to Atimadh. She said goodbye to everyone individually and offered each of us a small silver item which we think she might have made herself. The women got small pendants, in the shape of the hand of Fatima, while the men got silver rings. She was a very good guide and this was incredibly generous! 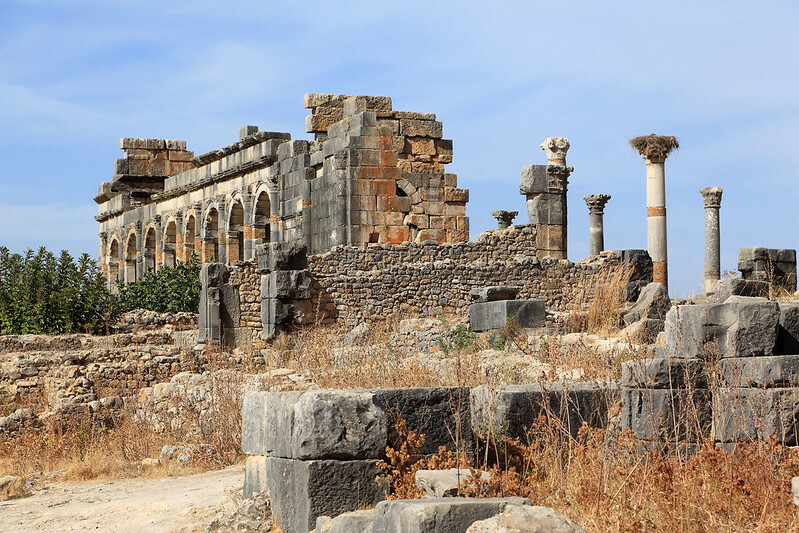 We boarded the bus for about an hour's drive to the ruins of Volubilis, a Roman city dating from the time of Emperor Caracalla, around 200 A.D. Here we met a local guide for the ruins, who led us on a one hour walk to see the highlights of the old city. The city was built on the side of a hill, near the top, so it commanded a good view of the plains below, now filled with farms. 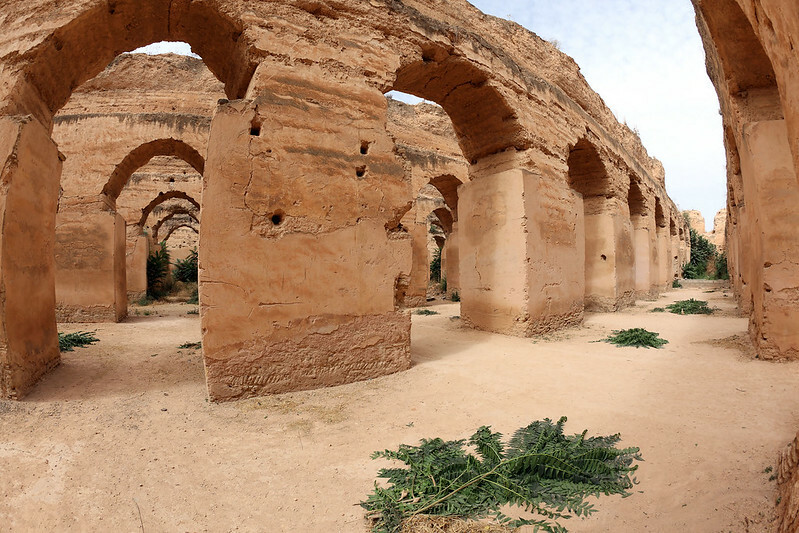 It was very hot and sunny and there was very little shade, so it was a bit of an ordeal, but the ruins were very interesting, with several houses showing intricate mosaic floors, including ones depicting Neptune, Hercules, Bacchus, and Ariadne, among others. There were also baths, a vomitorium, a basilica with an arched wall and some columns, and a triumphal arch of Caracalla. The guide explained that much of the building work had been restored by French archaeologists in the 1910s, who rebuilt the arches and erected the columns from tumbled stone. The site is a World Heritage Site. 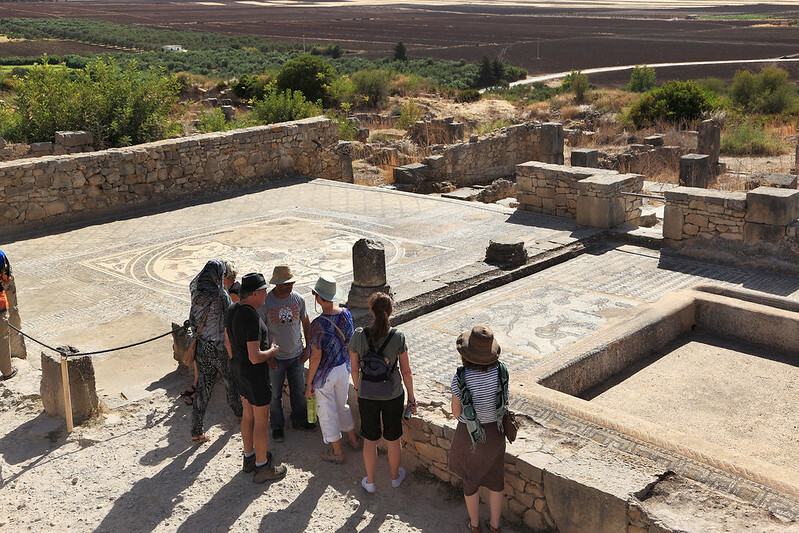 Looking at Roman mosaics, Volubilis. Back at the entrance was a very modern visitor area with toilets, built of polished limestone, and a run down shack selling drinks and ice creams. There we rejoined Maria and Anna, who had opted out of walking in the sun and had sat in the shade with drinks while they waited. Lahcen gave the rest of us ten minutes to have a drink and cool down before we boarded the bus for the drive to Fes. We had a stop at a roadside vegetable stall on a cliff side overlooking a valley in which had been built a dam a few years ago, the Barrage Sidi Chahed. This provided a nice view of the resulting lake and a photo opportunity, as well as a chance to stretch our legs. 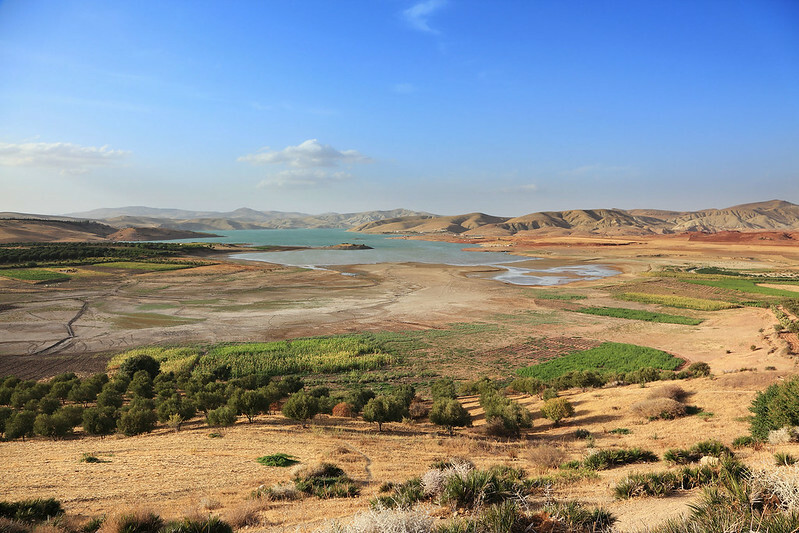 Lac de Barrage Sidi Chahed. 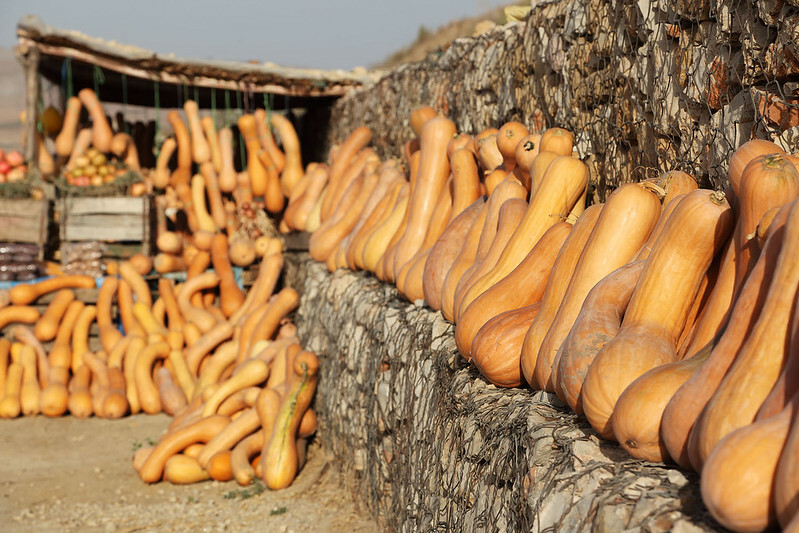 But the best photo op there was the huge stacks of long gourd-like pumpkins in the golden late afternoon sun. We are approaching Fes now. Lahcen says we will have one of our three included dinners tonight, at the place where we will be staying for the next three nights. He ordered pastillas by phoning ahead, taking our orders for chicken, pigeon, or vegetable, as he said they took a long time to prepare and cook. 23:20. Riad Dar Aneber, Fes. We reached our hotel in Fes a bit after 19:00. We had to walk into the medina in the old 9th century town area a bit, through narrow alleyways to reach the accommodation. We actually walked towards a very swish looking five star style hotel, the Sofitel Palais Jamais, and some of us thought that was where we were staying, but then our hotel guide led us straight past it and down a narrow alley. Down there was another very nice looking hotel, with marble and glass entry, but not as fancy as the first one. Our guide led us past that and turned down an even narrower alley that sloped downhill. After a few more turns, we eventually arrived at a short dead end alley and he led us into the Riad Dar Anebar, where we are staying. It's not five star, but it's actually very nice, with an open courtyard in the middle with tiled floor and a fountain, surrounded by rooms accessed through multiple narrow staircases which lead off the courtyard. At first we were welcomed and instructed to sit and rest, then the staff brought us biscotti and mint tea while we waited for our luggage to arrive. I tried the tea with sugar, which was very sweet, like it had about five spoons of sugar in it. Courtyard at Riad Dar Anebar. 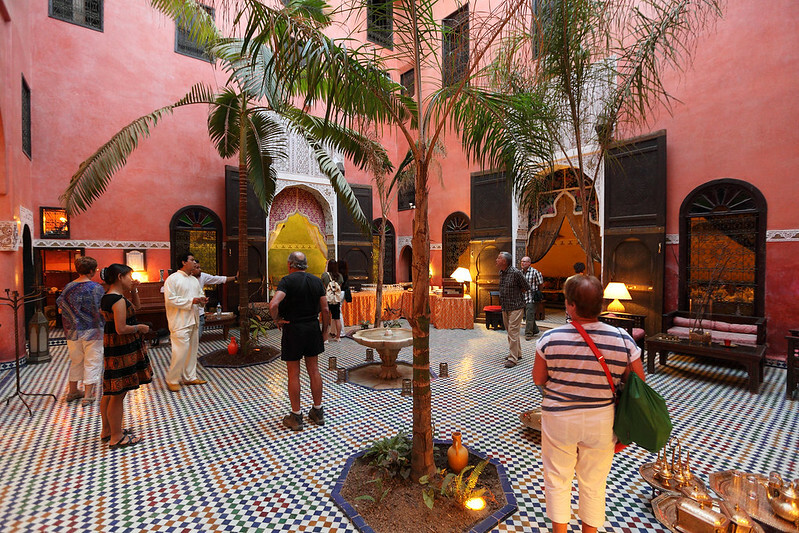 Some of the group are staying in a second riad just down the alley, which is part of the same hotel. We were given our keys and shown to our rooms in random order. We climbed up to our room on the second floor and were impressed by the huge size and lovely antique furniture and the carved wood decorations and intricately tiled floor, then blown away again by the huge bathroom with double sinks. We opened one of the four shuttered windows in the room and looked down on the courtyard below where some of the others were still waiting. They spotted me peering out and asked me about the room. I said it was lovely, and then the guy who showed us the room admonished me not to mention that to the others, as we had been given a very good room, but some of them had rooms that were... less impressive. It seems our room might well be the honeymoon suite or equivalent, given to us as we are the only married couple in the group. I went back down to claim our luggage from the set of bags which porters had brought from the bus for us, and instruct them which bags were ours. To do so, I had to go over to the second riad, where all the bags had been taken. When I got there, there was a kerfuffle because Graham was livid about the room he was sharing with Greg being too small. Ben offered to swap rooms with them, because the room he had been given was on the ground floor and he didn't really like that it was accessible directly off the lobby area, or that the door didn't seem to lock properly. At dinner later he mentioned that Terry had actually opened his door accidentally, thinking it was the door out to the alley, when Ben had locked it! We decided we'd better play down how good our room was if anyone asked us. We showered before dinner, to wash off the heat and dust of the day and present for dinner at 20:30 all cleaned up. I put on my best clothes that I'd packed for the dinner in the riad. There were dining alcoves off the main courtyard downstairs, but we joined a few of the others sitting in the tea area, who were having glasses of wine before dinner. When Anna joined us a few minutes later, we agreed to split buying another bottle of wine. She and I went over to the area across the courtyard where a waiter was serving the wine. We picked a bottle and had a taste - it was good. The bottle said "Semillant", so I thought it might be Semillon, but it tasted more like a Pinot Gris. The waiter poured us a glass each. I asked for another glass for my wife, and the waiter said he thought Anna was my wife! Anna said no, she was just the mistress! That had us laughing for a good few minutes as we returned and explained to the others. 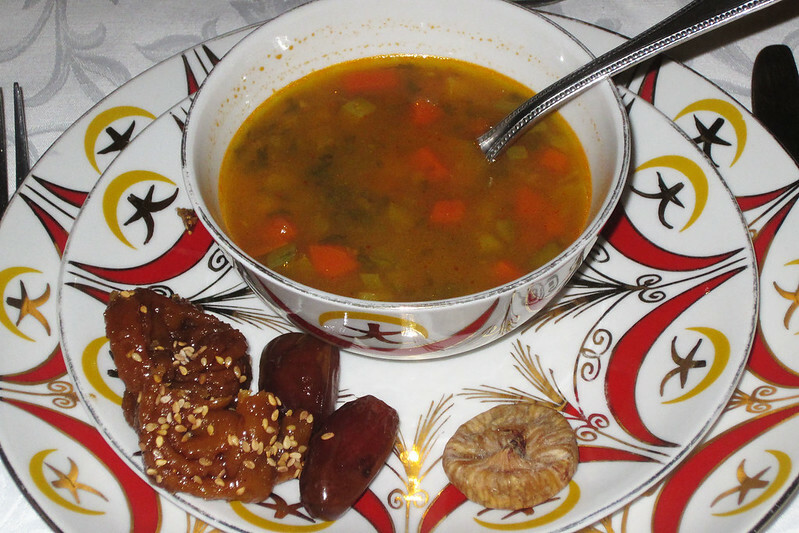 Vegetable soup with dates, figs, and honey cakes. The waiters soon herded us to tables for dinner. There were two tables set for eight people, on opposite ends of one of the alcoves. We sat with Anna, Ben, Michelle, Greg, Graham, and Lahcen. The waiters started by bringing us plates with dates, dried figs, and honey cakes on them. When we queried why these sweet things had come out first, the waiter explained they would be bringing out soup, and Lahcen elaborated that you would eat the fruit or cakes with the soup. That sounded interesting, and we all tried it when the soup arrived, which was a very nice vegetable soup. The next course were the pastillas. M.'s vegetable one had carrots and zucchini with vermicelli inside the crispy pastry, which she described afterwards as a giant spring roll. My pigeon one was spiced with nuts, honey, and cinnamon, with crushed peanuts sprinkled on top. It was slightly sweet and delicious. Then they brought out sweet pastilla pastry sheets with cream and nuts as a dessert. It was only mildly sweet, with the cream being semi-curdled like a soft Mascarpone. It was delicious. The meal done, we returned to our room, brushed our teeth, and now I am about to fall asleep. Last updated: Monday, 30 March, 2015; 01:46:02 PDT.